The Green Telephone Box - office23s jimdo page! West Dean was recorded in the Domesday book of 1086 simply as Dene, from an old Anglo-Saxon word meaning 'Valley'. It is one of those villages that appears in picture books, as jigsaws and on the lids of chocolate boxes. It is hidden just off the Seaford to Eastbourne coast road and to get to the village you need to take a side road, which then returns upon itself. On its narrow streets heavy with 'olde worlde' charm and not far from the Saxon church dedicated to 'All Saints' stands a green telelphone box. The box itself is of a K6 type; designed to commemorate the silver jubilee of King George V. The K6 was the first red telephone kisk to be used extensively outside of London and has since become a British icon. Telephone boxes were generally painted bright red to match post boxes and in turn the livery of the General Post Office. Originally the designer, Sir Giles Gilbert Scott, had intended his kiosks to be painted silver, with a "greeny-blue" interior. The red that is now much loved was once anything but and caused many local difficulties resulting in requests for less visible colours. In response the Post Office was forced into allowing a number of telephone boxes to be painted a less strident grey and others green, like that at West Dean, in areas of natural and architectural beauty. 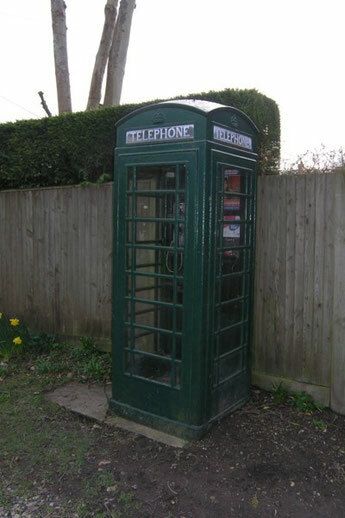 A green phone box once stood in Kings Moss on Merseyside, where it was believed to be England's only green telephone box! It was removed in the early 1990's and despite a local campaign, and to my knowledge, has yet to be reinstalled. Another green telephone box nestles next to the small museum at Okeford Fitzpaine in Dorset, it has been afforded the status of a grade II listed building. Instead of the usual red it was painted in the green livery of the Pitt-Rivers Estate which owned thousands of acres of land in the area.